451 Research recently surveyed 1,804 United States consumers. 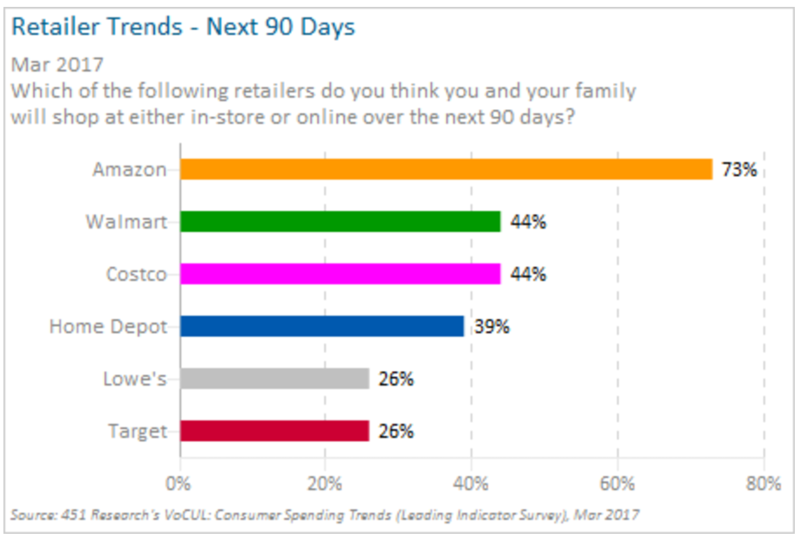 The survey had questions about which retailers they'll be shopping at either in-store or online over the next 90 days. Online retail giant Amazon leads by a wide margin, with 73% saying they'll shop there for all types of purchases. Walmart (44%) and Costco (44%) tied for second. A total of 39% plan to shop at Home Depot and 26% at Lowe's. Target also garners 26% of shoppers. Amazon also leads in home entertainment and electronics shopping, with 60% of respondents saying they'll shop there over the next 90 days—unchanged from previously. Best Buy (31%; down one point) is trending lower for the third consecutive survey. The 451 Alliance is a member-driven think tank that tracks changes in enterprise IT.